The Craft Heroes are Preparing for Craft Emergency! Be Prepared for a Flood of Creativity! The St. Pete Craft Heroes in partnership with the Tampa Bay Chapter of the American Red Cross presents “A Craft Emergency” on Sunday June 1, 2008. Join us for an artistic benefit marking the first day of Hurricane Season and bringing support to the local Red Cross. Enjoy a diverse selection of fine crafts and original artworks from Florida artisans. Support local artists and local heroes at the same time! The Red Cross responds to emergencies in our community on a daily basis, from house fires to floods and educates the community on ways to be prepared for and react to emergency situations. The Red Cross will also be selling emergency items such as first aide kits and registering volunteers. Shoppers will have an opportunity to learn more about the many educational programs hosted by the Red Cross and can make monetary donations to support crises relief in the Tampa Bay area during this fun event. Show hours are 9 AM – 2 PM. Artists and Fine Handcrafted Items will be for sale in Red Cross Park, located on the corner of 4th Street North and 9th Avenue North in St. Petersburg, as well as in Hamilton Hall inside the Red Cross Building located at 818 4th St. N., St. Petersburg FL 33701. Interested vendors should contact The St. Pete Craft Heroes, online at www.craftheroes.com or email craftheroes@yahoo.com. The St. Pete Craft Heroes are local St. Petersburg jewelry creator Shannon Schafer/BoogieBead, find out more about her work online at www.boogiebead.etsy.com or email boogiebead@yahoo.com, and local St. Petersburg artist Coralette Damme/The Crafty Hag, find out more about her work online at www.craftyhag.com or email Coralette@craftyhag.com. For more information about The Tampa Bay Chapter of the American Red Cross, contact Lise Amundrud, 727-898-3111 ext. 235, email amundrudl@usa.redcross.org, or visit www.redcrosstbc.org. Sunday June 1, 2008 from 9 AM to 2 PM, vendor set up time 7:30-9 AM. · Vendors must be set up and ready to sell upon start time of event and will not break down prior to stated end time. · A portion of vendor registration fees will be donated to The Tampa Bay Chapter of the American Red Cross. · Promotional event post cards will be printed and available for vendors to use to advertise the event to their friends, relatives, and customers. Please promote on your blogs and to your email lists as well! · All items sold must be handcrafted by the vendor and described on vendor application. In order to maintain a diverse show the number of vendors selling similar types of wares will be limited. Exhibitors will be selected by the st. pete craft crew based on the description and photos provided with the application. · Vendors are responsible for collection of any and all applicable sales taxes. Vendors will be able to park and unload in the Red Cross Parking Lots located on 4th St. N. and on Dartmouth St. but will be asked to move vehicles to spaces on residential side streets during the event to provide convenient parking for customers. It is NOT recommended to park in the Starbucks lot, they will tow! Vendors outside must bring their own tables/tents/chairs etc. There is not access to electricity indoors or outdoors. Indoor spaces are limited and include the use of one table if needed. · Space Fee: $30.00-- Outdoor Spaces are approximately 10'xl0'. A limited number of indoor spaces are available but they are smaller, will accommodate 1- 6’ table, overall size approx 3’ x 8’. Outdoor spaces will be on both grassy and paved surfaces, come prepared for either possibility if you select an outdoor space. Request an application form from craftheroes@yahoo.com. Please include a website where examples of the items you will be selling can be seen or attach a minimum of 3 photos with your check and application. Include a self addressed stamped envelope if you would like your photos returned to you. If your application is NOT approved, your check will be returned to you with photos if SASE is provided or will be destroyed. Enclose a copy of the signed liability release form with your check, photos, SASE, and completed application. 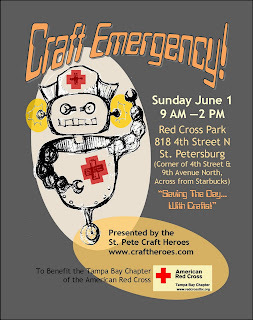 Craft Emergency Hits St. Pete June 1! 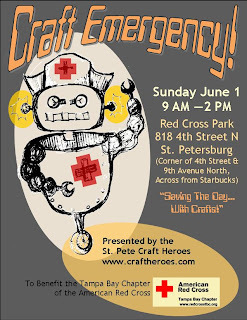 Get ready for a flash flood of creativity when Craft Emergency hits St. Petersburg! The St. Pete Craft Heroes are proud to present this awesome arts event as a benefit for the Tampa Bay Chapter of the American Red Cross! Kick off hurricane season with the St. Pete Craft Heroes and the Red Cross! All arts and fine craft vendors participating in this sale have made a contribution to benefit the Tampa Bay Chapter of the American Red Cross. Shoppers can stock up on hand crafted items from a variety of awesome local artisans while they learn more about how the Red Cross supports those in need in our community. Pick up a first aid kit, CPR supplies, register for a class, or sign up as a volunteer--and of course monetary donations will be accepted as well. The Tampa Bay Chapter of the American Red Cross responds to disasters locally on a day to day basis while teaching people how to safely respond to unexpected situations.